This dip is going to rock your world. But first, for all of you who are all like, “WTF is a hoagie?” … let’s get this settled before I begin. A “hoagie” is the Philly word for a Sub Sandwich. A submarine. It’s all the same thing. In Philly… we call them hoagies. That’s all I’ve ever known, and all I’ll ever call it, so don’t try and convince me otherwise. 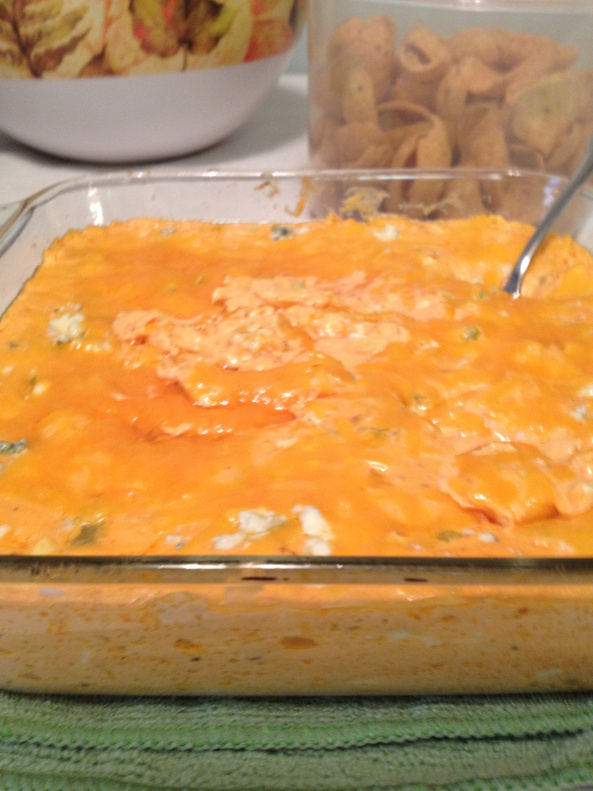 SO, this fabulous dip that I’m finally sharing with you (I made it for my Superbowl party!) is a mixture all of the delicious ingredients that go into an Italian Hoagie. As a dip. Whaaaaaaaaaaaa? I know. It’s ridiculous, and you have to trust me on this, you’re going to love it. My boyfriend Dave’s obsession with Hoagie Dip started a few years ago, when our friend Allie brought over a grocery store deli-made container of it. He (and I) fell in love. Allie wasn’t welcome unless she had a container for a few years. After not having the famous Hoagie Dip for some time, I decided it was my turn to give it a go and try to make it from scratch. It turned out amazing, and my favorite part being that it was customizable with light-mayo instead of whatever gross stuff they use at the store. 1. Chop the Onion, Banana Peppers, Tomato, and Iceberg into a small dice. Put into a bowl and set aside. 2. 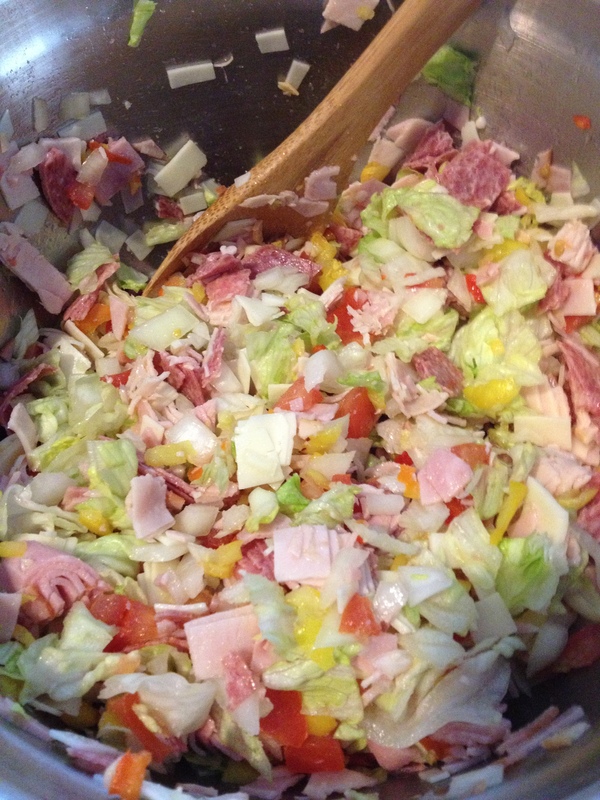 Chop the Deli Meats and Cheese into small squares/pieces and add into the bowl. Add the rest of the ingredients and stir. Serve in a bread bowl if you’d like. Easy-Peasy, right?! You can add Mayo if you want it to be a little creamier, but I liked it the way this turned out. It was much less mayo-ey than the store bought kind which I definitely appreciated. 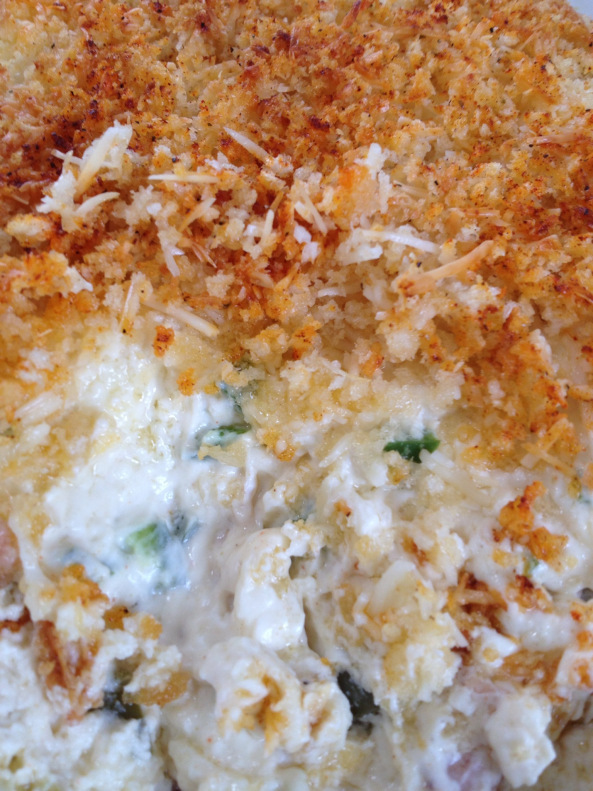 Serve this dip with Triscuits, sliced Baguettes, or really anything! 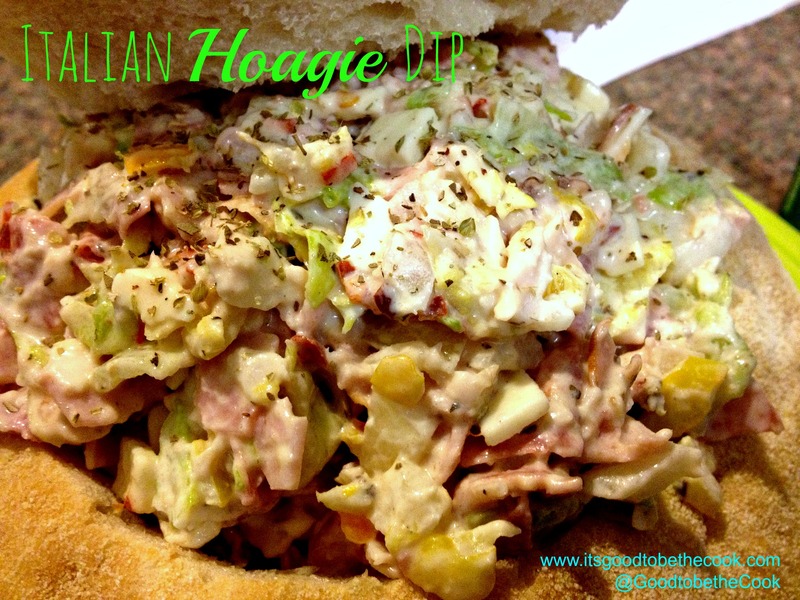 This dip tastes just like the real thing… an Italian Hoagie!!!! Had to show off my bread bowl! How much would you say this makes? I am taking some appetizers to a party with 10 of us. This won’t be the only food by any means 😜 But would you recommend doubling the recipe? Thank you for sharing! Hi Tiffani! I think if it’s not the only app you’re probably good! We had the same amount of people maybe a few more. Let me know how it goes! Actually made for dinner tonight and scooped into pita bread! Yummy! Im going to try this and omit the lettuce and serve whole lettuce leaves on the side so you can wrap the mixture in the lettuce. Like a lettuce wrap. Wouldn’t the lettuce get soggy…? I’ve actually used cabbage with great success. LOL! Then you’d be eating a hoagie. Not one of the most awesome appetizers ever! This sounds delicious. Thanks for sharing on Foodie Friends Friday. Please stop back by today to vote. One of my friends at work talks about this all the time. I have never tried it, so now is my chance! Thank you for sharing! Visiting from DC in STYLE Link UP! You have a great site!!! Looking forward to following along! Mmmm yam, looks delicious!!! 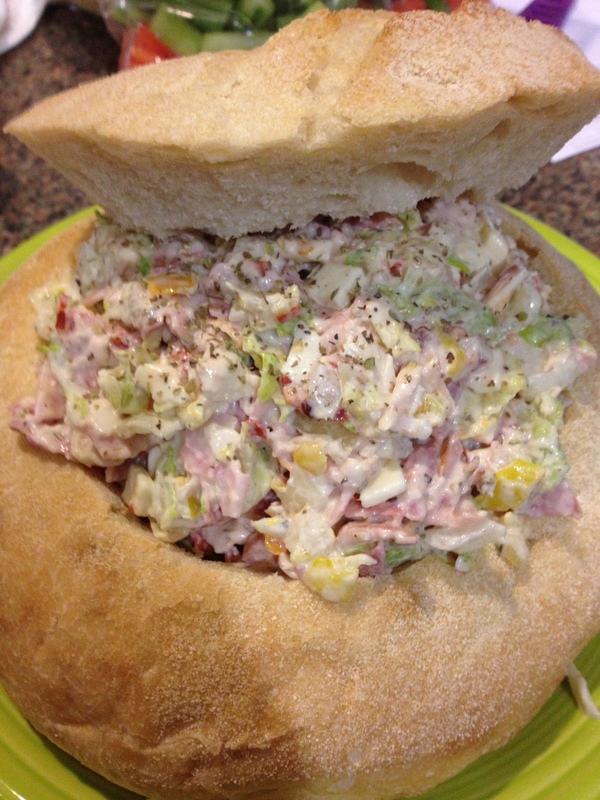 I made soup in a bread bowl but never the dip-I should try this one! I’m hosting a recipe link up party on my blog and would be thrilled if you decided to participate!!! I had to read this like 8 times to understand that you wanted to eat the dip and not “toe – at – it” … too funny. It is so delicious, you’ll have to try it out! Thinking about adding more lettuce, cut the same, and some extra dressing and serving it as a salad.